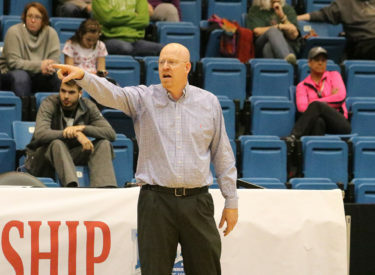 LIBERAL, Kan. – The second winningest coach in Lady Saints history will be coaching elsewhere next season as current Seward County head coach Toby Wynn has accepted the head coaching position at Emporia State to coach the Lady Hornets. Wynn just completed his thirteenth season as head coach and fourteenth season overall with Seward County after taking over for Hall of Fame coach Jim Littell. The Lady Saints didn’t miss a beat under Wynn, recording at least 20 wins in all 13 seasons, including back-to-back 30 win seasons the past two years. He led Seward to four Jayhawk Conference Championships, two Region VI Tournament Championships and three trips to the NJCAA Tournament, including two Elite Eight appearances and a 3rd place finish in 2007. He finishes his career at Seward winning over 80 percent of his games with a 349-84 record. His 349 career wins rank second only to Littell’s 418 wins. Wynn has won the Jayhawk West Coach of the Year three times, including back-to-back over the past two seasons. Not only has he excelled on the court, but he’s also held his team to lofty standards in the classroom. The women’s basketball program led the Jayhawk Conference in their sport in GPA in 2016-17, finishing with a 3.50 team GPA. Over the course of his 13 years as head coach, 28 Lady Saints have been named NJCAA Academic All-American. His player development has been second-to-none while coaching the Lady Saints. Wynn has recruited and produced three of the top five leading scorers in Lady Saint history, including the top two. He has also produced five of the top ten leaders in career blocked shots, four of the leaders in steals, three of the leaders in rebounds and two of the leaders in assists. Wynn has coached 15 NJCAA or WBCA All-Americans. His players have earned 39 All-Jayhawk West (18 First Team), 25 All-Region VI (12 First Team), five Jayhawk West Most Valuable Player and four Region VI Most Valuable Player award honors. Wynn will take over an Emporia State program that went 17-11 a season ago, securing their 22nd straight winning season. He will take over for Jory Collins who is the second winningest coach in Lady Hornets history. Seward County will begin a nation-wide search for Wynn’s replacement immediately.